WPX Hosting Vs WP Engine Hosting Review: Which Is Better? Home » Web Hosting » WPX Hosting Vs WP Engine Review 2019: Which Is Better? Both WPX and WPEngine are great hosts. WPX Hosting will cost you $25 per month and WPEngine will cost you $35 per month. Check features and your needs before giving a try to any of these hosts. If you’re looking for the best dedicated web hosting choice, this comparison of WPX hosting Vs WP Engine is just for you. All the above factors really play a key role in your website’s success. Aren’t they? That’s why picking the right hosting is always the first key step. So in this WPX hosting Vs WP Engine review post, let’s talk about why you need managed hosting along with the best options (and their pros and cons). Let’s get started. Why you need a better web hosting like managed hosting? WPX hosting? Is It the best dedicated hosting choice for WordPress users? WP Engine: Why should you use it? Majority of the people (read bloggers) don’t know the importance of using a better web hosting to run their sites. It doesn’t matter whether you’re using WordPress, drupal or any other blogging platform, you need the reliable, faster and safer hosting service to never get into SEO or website conversion related issues. If you don’t know how web hosting brings success to your website, then have a look at some of the reasons why a good web hosting provider matters a lot. #1. Bad hosting gives you frequent downtime issues and managed hosting gives you incredible website experience: Most beginners use either free or cheap hosting services to run their WordPress sites which I think is a biggest blogging mistake. If you want to make money from blogging, make sure you invest money in getting the right hosting. Without it, you will face frequent downtime issues by using a bad hosting (it happened with me due to Hostgator hosting and later on I moved to a better hosting called WPX hosting). #2. Fast Loading Websites Are What Your Audience Want: How fast your page is loading when any user clicks your website is very important. If you choose bad web hosting provider, you will experience poor quality hardware. You will also lose lot of sales due to slow sites. #3. You’ll Get The BETTER Support: If you choose a good web hosting provider, you will have multiple support methods. But, if you are with a host that doesn’t offer such support services, it affects your website a lot. The reason I went for WPX hosting (even though it is bit expensive than Bluehost and others) is because of the faster support. You get help within minutes from their team to resolve your hosting related issues. #4. Managed Hosting Helps In Increasing Your SEO: Hosting plays a crucial role in your website speed which directly impacts your search rankings. If you want to get ranked in the top pages of search results, then choosing the best web hosting service provider is really important. So choosing the right web hosting provider matters a lot if you are really serious about making money through your website. Now, you really want to know which web hosting provider to choose. 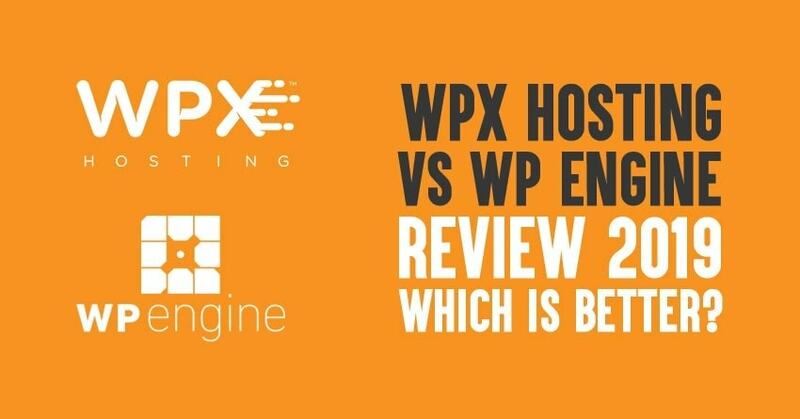 Here it goes the comparison of WPX hosting vs WP Engine review for 2019. WPX hosting can be considered as a faster, reliable and secure managed hosting choice for WordPress users which costs you $24.95 per month for basic plan whereas WP Engine is the #1 managed WordPress hosting solution, mostly used by experts and costs you $35 per month for the startup plan. Let’s first talk about the features of WPX hosting along with its pros and cons in this unbiased WPX hosting vs WP Engine review post. One of the main reasons most of the people don’t want to switch web hosting companies is the trouble of moving their site. If you don’t have technical skills then this process is highly difficult. However, there are products like Backupbuddy that makes website migration easier. But, it costs lot of money. There is a potential possibility to make mistakes during this process which will lead to downtime of your site. With WPX Hosting, you will get free site migration within 24 hours offer. Just pick up the plan and enter all your relevant details. Submit a ticket to do the migration. You just need to include your ftp server and WP admin site login details. You will get an instant reply to your ticket stating that they had started working on your migration. Soon, you will receive message saying your site is ready to go. Once everything is loading correctly, re-configure your W3 Total Cache plugin. WPX Hosting has its own specifically tuned settings for W3 Total Cache which you can download from your control panel. Just import it into your W3 Total Cache admin panel. The #1 thing I like about WPX hosting is they offer instant support. You don’t have to wait for hours (or even minutes) to get a response from their staff. The support WPX Hosting offers is really awesome. Whatever the tickets you raise, you will get response in less than 5 minutes. Connecting to someone on Live Chat is pretty much instant. Most of the popular web hosts takes good amount of time during peak hours to finally talk to someone. Create email and FTP accounts. From the webmail interface itself, you can add email address forwarding. The basic plans of WordPress hosting only allow you to host one domain. You need to pay two or three times the cost of your shared hosting plan to use the plan for a few domains. If you look at WPX Hosting’s plans, even their lowest cost plan gives you 5 installs for just $24.99. Business Plan: If you are just starting a new blog and want a better, super fast and reliable WordPress hosting, then this plan is for you. It comes at $24.99 per month. You can host up to 5 websites with a bandwidth of 50 GB. You will also get 10 GB disk space along with the dedicated RAM and SSD servers to boost your website loading times. Professional Plan: If you are looking for slightly more advanced version, then Professional plan is for you. It offers great flexibility that you can host up to 15 sites at a time. It comes at $49.99 per month. You can host up to 15 websites with a bandwidth of 100 GB. You will also get 20 GB disk space along with the dedicated RAM and SSD servers to boost your website speed and performance. With this plan, you will get 30 day money back guarantee which is very awesome. Elite Plan: If your website gets high amount of traffic, then you should go for this plan as it is the most advanced plan which is most useful for high traffic websites. If you are getting a lot of search traffic to your sites and looking for a dedicated hosting, then this plan is or you. It comes at $99 per month. You can host up to 35 websites with unlimited bandwidth. You will also get 40 GB disk space along with the dedicated RAM and SSD servers to boost your website loading speed. This plan also offers a 30 day money back guarantee. The one beauty with WPX Hosting is that, with all these plans, you will get features like 24/7 customer support, Free site migrations, Daily backups, Free email setup, Daily malware scan, 30 days money back guarantee. WPX Hosting offers completely free SSL certificates that are sponsored by Google. A couple of clicks in the control panel is enough to activate SSL. WPX Hosting can handle high traffic loads. Using this service, you can simulate the load of 25 virtual users visiting your site at the same time If you want, you can check this, with the help of load testing service, load impact. WPX Hosting only offers dedicated WordPress hosting which means their servers are specifically optimized to squeeze as much speed out of WordPress as possible. WPX Hosting is actually cheaper than it’s closest competitors whilst offering more for your money. WPX Hosting is the only hosting service that hosts on servers through High Speed SSD. It offers daily backups, free DDoS protection, daily malware scans and unlimited SSL certificates all these for FREE. It offers fast server with Dedicated RAM and SSD. It offers responsive and fast customer support. You can create email for any domain. You can install WP plugins. No restrictions. It supports multiple installs per plan. Offers free site migration within 24 hours. It offers email spam and virus filtering. Interface is lacking on features. However, this could be classed as a pro since the interface is easier to work with. If you are an absolute beginner and on a budget then their pricing may trouble you as it starts at $24.99 per month. Speed is one of the main factors while choosing web hosting as it affects the user experience that your visitors will see when they come to your site. It also affects the way that Google looks at and ranks your site. With WPX Hosting, you can load your site very fastly and also it offers the best customer support. If you are searching for a dedicated, affordable and secured web hosting service, then WPX Hosting is the best one to go. Recommended: WPX vs Bluehost: which is the better host in 2019? Let’s now talk about WP Engine features, pros and cons in this detailed WPX hosting vs WP Engine review post. Are you ready? Let’s discover its benefits first. WP Engine offers a number of premium security features. Before upgrading their customers, WP Engine tests any major core updates. To block any DDoS attacks, brute force attacks, SQL-injection attacks etc, they have a proprietary intrusion detection and prevention system. To conduct regular code reviews and security audits, they also partner with third-party security firms. Your security is guaranteed, so if your website gets hacked WP Engine will fix it for free. There is also a discrete password-protected ticketing system. They run automated backups to keep everything off-site. WP Engine has over 100 trained WordPress experts. You will get 24/7 customer support through live chat for all customers. Phone support is available 24/7 with all other plans except for the Personal plan. If an issue can’t be immediately resolved through chat or phone, the support staff will create an internal support ticket for you. Enterprise customers get access to 24/7 ticket support via email. It has a dedicated Customer Experience Operations team and they work to continually improve the WP Engine customer experience. The company has a secondary custom control panel called the “User Portal” that facilitates most account-related tasks like creating backups, adding new WordPress installs, creating redirections etc. The pricing of WP Engine is bit costly. WP Engine has three shared hosting subscription options ranging from $29 to $299 per month depending on the type of plan and duration of contract. Their personal plan is $29/mo and includes a single install and only up to 25,000 visits per month. All plans include unlimited data transfer. The main difference between the plans are the site optimization capacity based on estimated monthly site visitors, data storage capacity, number of WordPress installs and availability of imported SSL Certificates. Instant creation copy of a user’s website for testing is also available in all plans. The one feature exclusively comes with the Business plan is that it includes access to WordPress optimized Google Analytics data to help users drive content strategy directly to the user dashboard. In terms of customer support, all plans have 24/7 live chat support while only the Professional and Business plans have 24/7 phone support. So let’s talk about WP Engine features in this WPX hosting vs WP Engine review so you will get a better understanding about which one to choose to run your sites. It offers one of the fastest servers to its users. So the sites that are hosted on WPEngine will be really faster. WP Engine offers a content delivery network in partnership with NetDNA which makes their hosting even faster. WP Engine offers 60 day money back guarantee which means if you are not happy with their service, you can cancel your account within the first 60 days and receive a full refund. However, this guarantee applies to the Personal, Professional, and Business plans only. WP Engine keeps your site protected with many advanced security features that other hosts don’t offer. It’s proprietary front-end layer system can handle traffic spikes easily without slowing down your site. WP Engine’s entire support staff is comprised of trained WordPress experts. They offer the best support, WP features like staging and caching and easy backup. Even unoptimized WordPress installs do well on their platform as their platform does the extra work. WP Engine is extremely expensive, but the services they offer are well-worth the investment. WP Engine doesn’t offer domain registrations. This means you will have to register your domains with another company which some users may find inconvenient. You can’t install certain plugins on your WordPress site because they cause a high server load. In a nutshell, let me use this WPX hosting vs WP Engine review to clarify that if you are looking for a completely hassle-free web host for your WordPress site, then WP Engine is an ideal choice. There is a plenty of room to scale up your hosting as your traffic increases. Even though it is expensive, the services offered by WP Engine are worth for it and it saves much of your time. #1. Unlimited shared hosting is a BIG lie: Did you know the #1 reason why shared hosting is popular? Because those companies will tell you that they offer unlimited shared hosting. But is it really true? No. Every server has limits. Anything Unlimited on shared hosting plans is not at all possible. In most of the cases, shared hosting provider will disable your site, if you are using up too much space or bandwidth. #2. Shared hosting doesn’t offer any value: Usually, Shared hosting providers rent out a single server to as many people as possible to make money. This is good for them and bad for consumers. #3. Shared hosting gets frequent downtime issues: If you want your website to be visited by thousands of people every single day, then you should never consider using shared hosting. If you are doing blogging for a hobby and don’t have intentions to make money from it, then only shared hosting is good to go. Search engine removes sites from its search ranking that doesn’t maintain quality standards. Shared hosting kills your business growth as it can’t handle much traffic. So, it is always better to start with right web hosting provider that scales up according to your business growth. #4. Shared hosting have traffic limits: They think of making money only and never care about customers. You can’t imagine what happens to your website, once it reaches certain traffic limit. So, it is always recommended to go for the best web hosting provider and is absolutely worth investing money even if you are on a tight budget. #5. Not possible to get extra resources: If you want to deal with your traffic spike, then it is not possible to get extra resources. If you cross the limit they mention, your site will be collapsed. For example, if any other user has the problem, then they will take the whole server down to solve one person’s problem. You will lose uptime and you can’t take these risks when you are seriously into business. If you opt for VPS Hosting server, you will get your own work space which is not at all possible in shared hosting. And by opting Shared hosting, you are inviting much troubles and headaches. No one likes to read content from a slow loading website and one that goes down often. So make sure to go or dedicated hosting services like WPX hosting vs WP Engine (Coupon available). Pick the best one among them according to your blogging and budget needs and you will be happy for the decision. So we have so far discussed the benefits of using managed web hosting, why you should never use shared hosting along with the best options in this detailed WPX hosting vs WP Engine review. In my opinion, both of these hosting services are really good. So carefully go through their features along with the pricing and pick the best one among them? Did you find this in-depth WPX hosting Vs WP Engine review useful? Do you have any questions? Share your thoughts in the comments. I read lot of positive reviews about WP Engine and I must say I’m impressed by its features. I will surely consider this comparison and pick one. Thanks for this awesome review. I have been hosting on iPage and it is expiring soon now after reading this awesome review, I think I should go for the WPEngine. Anyways, thanks for clearing some of my doubts which stopped me from changing the web host to WP Engine but now I am all clear. Once again thanks for sharing. This is a big helpful article, sir. I knew about better hosting and while I want to purchase a hosting at an upcoming time, so at that time this article is much helpful for me. Now my blog is running on blogger platform. So sir I heartily say thanks for giving this information.